This chapter describes what Earth system models are and how they are used. Model-based projections of climate change at a global scale are presented, along with a discussion of the global carbon budget and methods to downscale coarse resolution global model projections to finer spatial scales. Flato, G., Gillett, N., Arora, V., Cannon, A. and Anstey, J. (2019): Modelling Future Climate Change; Chapter 3 in Canada’s Changing Climate Report, (ed.) E. Bush and D.S. Lemmen; Government of Canada, Ottawa, Ontario, p. 74-111. Emissions of greenhouse gases from human activity, particularly carbon dioxide, will largely determine the magnitude of climate change over the next century. Therefore, reducing human emissions will reduce future climate change. In the near term (to approximately 2040), projected warming will be similar under all emission pathways. 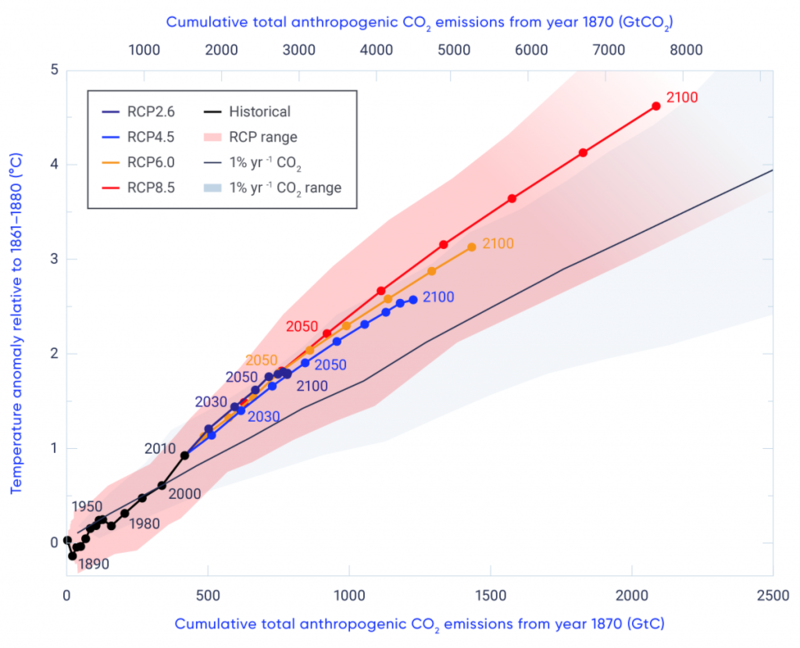 But by the late 21st century, the differences between possible emission pathways will have a considerable effect. Available estimates indicate that the global climate will warm by an additional 1°C (for a low emission scenario) to 3.7°C (for a high emission scenario). Scenarios that would limit warming to an additional 1°C or less require rapid and deep emission reductions. Global temperature change is effectively irreversible on multi-century timescales. This is because the total amount of carbon dioxide emitted over time is the main determinant of global temperature change and because carbon dioxide has a long (century-scale) lifetime in the atmosphere. 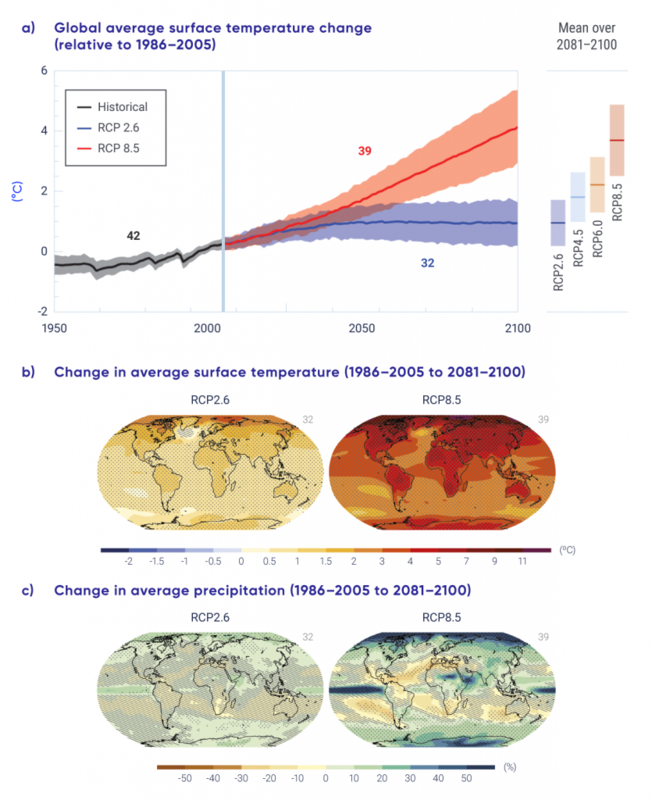 Climate projections are based on computer models that represent the global climate system at coarse resolution. Understanding the effects of climate change for specific regions benefits from methods to downscale these projections. However, uncertainty in climate projections is larger as one goes from global to regional to local scale. This chapter provides an overview of Earth system models and how they are used to simulate historical climate and to make projections of future climate. Historical simulations allow models to be evaluated via comparison with observations, and these show that models are able to reproduce many aspects of observed climate change and variability. They also allow experiments to be conducted in which human and natural causes of climate change can be identified and quantified. In order to make future projections, it is necessary to specify future emissions, or concentrations of greenhouse gases and aerosols, as well as future land-use change. Owing to uncertainty regarding future human activity (in particular, the extent to which ambitious emission reductions will be implemented), a range of future scenarios must be used. Results from future climate projections are discussed, along with sources of confidence and uncertainty. On average, the models project a future global mean temperature change (relative to the 1986–2005 reference period) of about 1°C for the low emission scenario (Representative Concentration Pathway [RCP] 2.6) and 3.7°C for the high emission scenario (RCP 8.5) by the late 21st century, with individual model results ranging about 1°C above or below the multi-model average. This change is over and above the 0.6°C change that had already occurred from 1850 to the reference period. The low emission scenario (RCP2.6) is consistent with limiting the global temperature increase to roughly 2°C and is therefore roughly compatible with the global temperature goal agreed to in the Paris Agreement. This scenario requires global carbon emissions to peak almost immediately and reduce to near zero well before the end of the century. Regardless of the global mean surface temperature level attained when emissions become net zero, temperature will remain at about that level for centuries. In other words, global temperature change is effectively irreversible on multi-century timescales. The relationship between cumulative emissions of carbon dioxide (CO2) and global mean surface temperature provides a simple means of connecting emissions from fossil fuels — the main source of anthropogenic CO2 — to climate change. It also leads to the concept of a carbon emissions budget — the amount of carbon that can be emitted before temperatures exceed a certain value. The Intergovernmental Panel on Climate Change (IPCC, 201424) has assessed that, to have a 50% chance of keeping global warming to less than 2°C above the pre-industrial value, CO2 emissions from 2011 onward would have to remain below 1300 billion tonnes of CO2 (GtCO2), roughly equal to what has already been emitted since the beginning of the Industrial Era. For a 50% chance of keeping the temperature increase to less than 1.5°C, emissions from 2011 onward would have to be limited to 550 GtCO2. It must be noted that estimation of carbon budgets, especially for low temperature targets, is a rapidly developing area of research, and updated budgets will be assessed in the near future. The chapter concludes with a discussion of downscaling methods, that is, methods to transform global Earth system model results into more detailed, local information better suited to impact studies. Downscaled results are often used in impact studies, but users must keep in mind that the enhanced detail provided does not necessarily mean added value, and that uncertainty is larger at smaller spatial scales. Future climate change will be driven primarily by human emissions of greenhouse gases (GHGs). Emissions of aerosols (airborne particles) collectively cool the climate and so offset some climate warming, but this effect is projected to decrease in the future as aerosol emissions decline. To understand the effects of these drivers on the climate, scientists use models — complex computer simulations of the climate system. Models are used to make projections of future climate, based on future scenarios of GHG and aerosol forcing. These models are developed and used at climate research institutions around the world, and results from multiple models allow us to estimate uncertainty and overall confidence in future projections. While Earth system models can simulate the climate system’s response to human emissions of GHGs, they cannot predict future human activities. Therefore, projections are made using various scenarios, or pathways, of future GHG concentrations, aerosol loading and land-use change (climate forcing agents; see Chapter 2, Section 2.3.1). These pathways are described in Section 3.2. In Section 3.3, Earth system models are briefly described, along with global-scale projections of future climate and sources of uncertainty in such projections. While all forcing agents affect climate, carbon dioxide (CO2) is the main determinant of long-term global temperature change. Section 3.4 describes the relationship between CO2 emissions and global temperature change — a relationship that is important in developing policies on temperature targets and on global emission reductions. This section also discusses why climate change is irreversible, due to the long lifetime of CO2 in the climate system. Finally, Section 3.5 discusses how global model results can be “downscaled” to provide more detailed regional information more suitable for impact assessment and adaptation planning. Projections of future climate change require projections of future climate forcing — the external drivers of change such as GHGs and aerosols. These projections, in turn, arise from scenarios of future GHG and aerosol emissions, which are based on varying assumptions about how human activities, such as fossil fuel consumption and land use, will change. 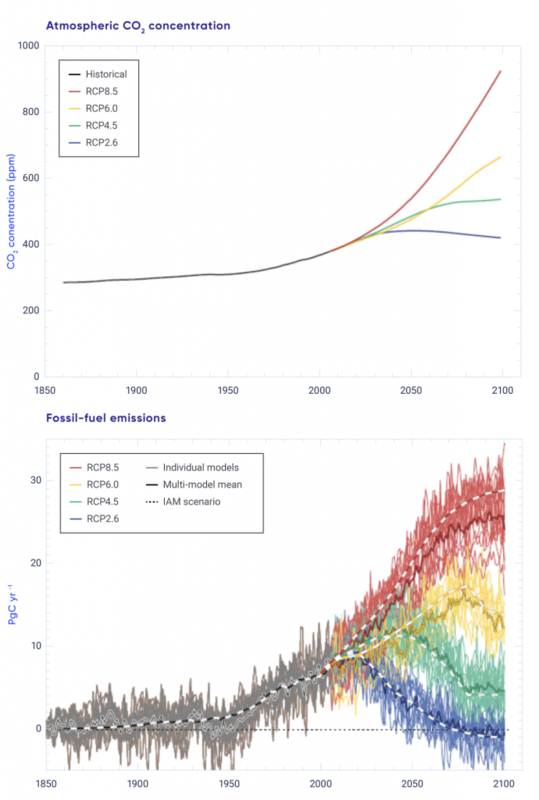 Future emission scenarios are typically developed using integrated assessment models, which combine economic, demographic, and policy modelling with simplified physical climate models to make projections of population growth, economic development, land use, and the implications of different policy options on climate-relevant emissions. As there is large uncertainty in the social and economic aspects of such projections, a range of scenarios is generally provided, ranging from those in which emissions are aggressively reduced to those with limited actions taken to mitigate emissions. The projections described in the IPCC Fifth Assessment (see Chapter 1) were based on a suite of future forcing scenarios called Representative Concentration Pathways (RCPs) that cover the period from 2006 onward (van Vuuren et al., 201154). The RCPs are identified by a number indicating the change in radiative forcing — the imbalance between the solar radiation entering the climate system and the infrared (longwave) radiation leaving it caused by greenhouse gases and other external drivers (see Chapter 2, Section 2.3.1) — by the end of the 21st century. RCP2.6 represents a low emission pathway with a change in radiative forcing of roughly 2.6 W/m2, RCP4.5 and RCP6 represent intermediate emission pathways, and RCP8.5 represents a pathway with continued growth in GHG emissions, leading to a radiative forcing of roughly 8.5 W/m2 at the end of the century. In this report, we will refer to climate scenarios based on RCP2.6 as “low emission scenarios,” those based on RCP4.5 and RCP6 as “medium emission scenarios,” and those based on RCP8.5 as “high emission scenarios.” For each RCP, the integrated assessment models provide a comprehensive time series of emissions and concentrations of individual GHGs (CO2, methane [CH4], nitrous oxide [N2O], chlorofluorocarbons, etc. ), along with aerosol emissions and land-use change. All of these forcings are inputs to Earth system models, which then simulate the future response of the climate system, including biogeochemical feedbacks, to these external forcing scenarios. The RCPs supersede the so-called “SRES scenarios” (Nakicenovic et al., 200040), which served as the basis for model runs reported in the IPCC Fourth Assessment Report. Although there are differences in detail, the SRES A2 forcing scenario is roughly comparable to RCP8.5, the SRES A1B scenario is roughly midway between RCP6 and RCP8.5, and SRES B1 is roughly comparable to RCP4.5 (e.g., Burkett et al., 20142). There was no SRES forcing scenario comparable to RCP2.6. These forcing scenarios are updated every few years, and new shared socioeconomic pathways (building upon the RCPs) will be used in model runs that will feed into the upcoming IPCC Sixth Assessment (e.g., Riahi et al., 201741). In all cases, CO2 is the largest contributor to the historical and projected change radiative forcing, followed by CH4 and N2O (Myhre et al., 201339; Collins et al., 20135). This means that future changes in human emissions of CO2 will largely determine future climate. Reproduced from van Vuuren et al. (2011), where further details are provided. In summary, projections of future climate require projections of future forcing from GHGs, aerosols, and land-use change, which in turn depend on projections of future population and energy consumption. CO2 is the largest contributor to human-induced climate forcing, and so CO2 emissions and the extent to which they grow or decline will largely determine future climate. In the near term (to approximately 2040), projected warming will be similar under all emission pathways. But by the late 21st century, the differences between possible emissions pathways will have a considerable effect. Available estimates indicate that the global climate will warm by an additional 1°C (for a low emission scenario) to 3.7°C (for a high emission scenario). Scenarios that would limit warming to an additional 1°C or less require rapid and deep emission reductions. Earth system models are based on a mathematical representation of the behaviour of the atmosphere, ocean, land surface, and cryosphere. They simulate a virtual planet using powerful supercomputers, allowing scientists to probe the connections between various physical and biogeochemical processes, e.g., how the ocean takes up heat and carbon, stores and then redistributes it. Two main ways such models are used are (1) to compare simulations with and without historical forcings to determine human versus natural forcing effects, and (2) to simulate future climate in response to various forcing scenarios. Earth system models have some features in common with global weather-prediction models (used to make daily weather forecasts) but do not depend on the use of observations as inputs and typically operate at somewhat lower spatial resolution (i.e., the level of spatial detail is often limited to features with scales of a hundred kilometres or larger). The lower resolution is necessitated by the computing demand of the long simulations that are required. Simulations begin with the historical period (from 1850 to present), driven by observationally based climate forcing (e.g., historical changes in GHG concentrations), and then continue into the future, using different forcing scenarios (such as those described in the previous section) out to year 2100 or further (Figure 3.2). Climate Research Division, Environment and Climate Change Canada. Earth system models represent an evolution from earlier physical climate models (representing the coupled atmosphere, ocean, land, and sea ice components of the climate system) to models that go beyond this with explicit representation of the carbon cycle (Flato, 201113; Flato et al., 201314). Including carbon and other biogeochemical cycles in the models allows simulation of global interactions among ecosystems, carbon, and climate, as well as several terrestrial processes that occur at high latitudes. Changes to snow and sea ice can cause positive (amplifying) snow/ice albedo feedbacks in the climate system (Euskirchen et al., 201612; Kashiwase et al., 201726; see Chapter 2, Box 2.4). As temperatures increase, the spatial extent of snow and sea ice declines, reducing the reflectivity of land and oceans, allowing more solar radiation to be absorbed, and hence further increasing temperatures. This feedback makes an important contribution to the higher rate of warming in the Arctic region, called Arctic amplification (FAQ 3.1; see Section 3.3.3). The models can also simulate increased growth of vegetation at northern high latitudes in response to a warming climate, an effect that may reduce the land surface albedo and affect the exchange of energy and water between the land and the atmosphere (Forkel et al., 201615). Changes in permafrost in response to changing climate — leading to changes in hydrological conditions and CH4 release (Schuur et al., 200844) — are also now included in some models. 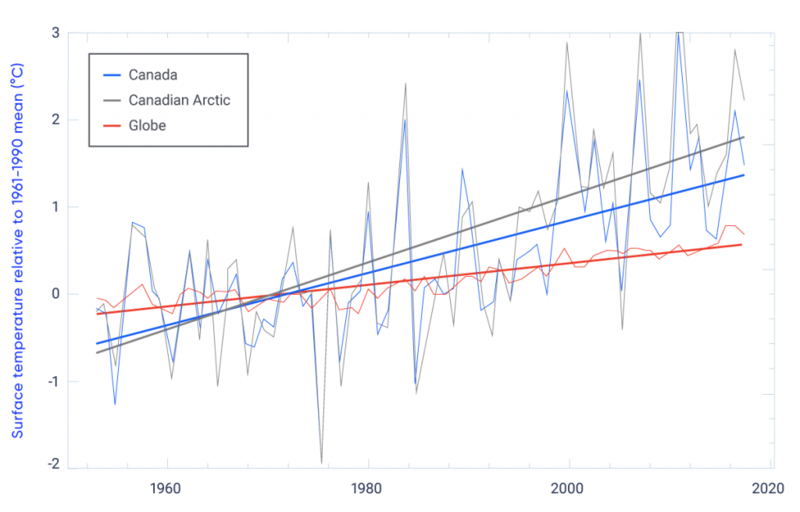 Why is Canada warming faster than the world as a whole? Environment Canada Climate Research Division. Adapted from Stuecker et al. (2018). Lapse-rate feedback: The lapse rate is how much the temperature in Earth’s atmosphere decreases as altitude increases. Differences in the lapse rate in different parts of the world affect the response to increasing greenhouse gas amounts. In the Arctic, for example, warming due to greenhouse gas forcing is largest near the surface. The opposite is true in the Tropics, where warming due to greenhouse gas forcing is largest higher up in the atmosphere, allowing radiant heat from Earth to more easily escape to space, and hence cool the climate. Snow/ice albedo feedback: Snow and ice reflect considerable solar energy back to space (see Chapter 2, Figure 2.4). Warming melts snow and ice, causing the now darker surface to absorb more solar radiation and heat further. Of course, this feedback only applies to regions where ice and snow are found. Thus, its contribution to warming is substantial in the Arctic and negligible in the Tropics. Planck feedback: The higher the temperature of any body (such as the Earth), the more energy it radiates, creating a cooling effect. This is a negative feedback that, ultimately, limits warming on a global scale. However, this cooling effect is weaker in the Arctic than in the Tropics, and therefore allows for a relatively larger warming response at high latitudes. Cloud feedback: In climate models, greenhouse gas forcing generally results in more cloudiness in high latitudes and less in low latitudes. 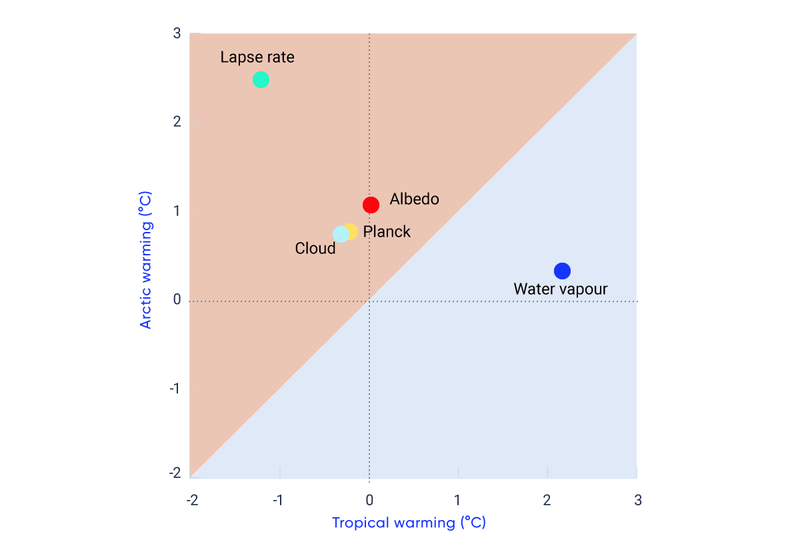 In the Arctic, the increase in clouds enhances warming by trapping heat near the surface. Water vapour feedback: Water vapour, like carbon dioxide, is a greenhouse gas. As the atmosphere warms, it is able to hold more water vapour and so warming is enhanced. The Arctic atmosphere is very dry and for this reason the contribution of the water vapour feedback to warming is small as compared to the Tropics, where the atmosphere is moist. In summary, warming caused by increasing greenhouse gas concentrations varies from place to place, largely due to differing feedbacks at play from one region of the world to the next. Enhanced rates of warming over Canada and the Canadian Arctic are due to a unique combination of such feedback mechanisms. How do we know that models are accurately projecting future climate? One method of measuring whether models can realistically represent the complex interconnections among climate processes is to gauge their ability to reproduce past changes. Simulations using observationally based historical forcing from 1850 onward provide the opportunity to directly compare model results to observations. The IPCC Assessment Reports have traditionally included a chapter devoted to this type of model evaluation (e.g., Flato et al., 201314), and these provide a synthesis of the large number of scientific papers on model performance. Figure 3.5 provides one example of model evaluation, comparing the annual global mean surface air temperature from several different sources with simulations from 36 different models that participated in the fifth phase of the Coupled Model Intercomparison Project (CMIP5; see Box 3.1). As the figure shows, Earth system models are able to reproduce the observed long-term increase in temperature (heavy black lines), along with the sporadic cooling that follows large explosive volcanic eruptions. 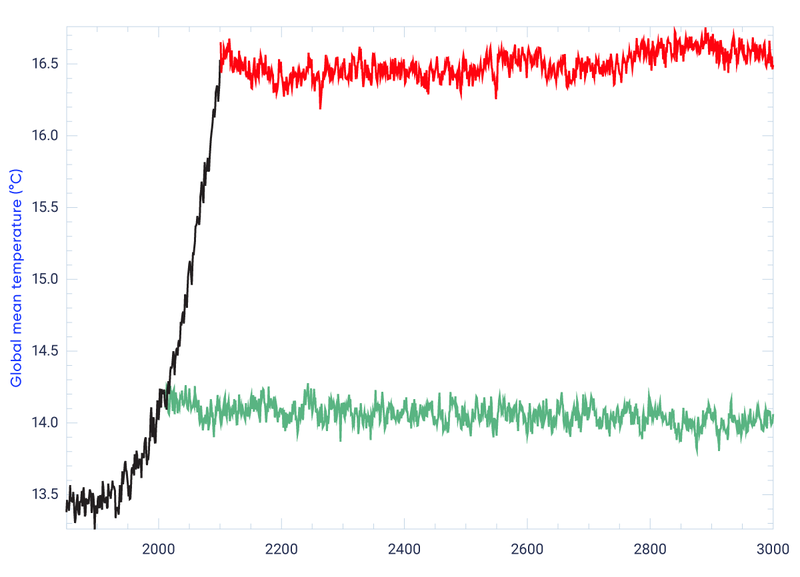 The magnitude of natural year-to-year variability is also well simulated (thin lines), although one does not expect individual ups and downs to coincide (as each model simulates its own internal variability). The heavy red line in the figure shows the multi-model average, which is an approximation of the response of the climate system to external forcing (changing GHG concentrations and aerosol amount, land-use change, variations in solar irradiance, and volcanic aerosol), upon which internal variability is superimposed. The difference between observed temperature and the multi-model average from roughly 2000 onward has been extensively analyzed (e.g., Fyfe et al., 201617) and is due to a combination of small errors in the observational record, decadal timescale internal variability, and incomplete early 21st century volcanic forcing in the models (see Chapter 2, Section 2.3.3). Adapted from Flato et al. (2013), Figure 9.8. All models used to project climate have some uncertainty associated with them, owing to approximations that must be made in representing certain physical processes. To understand the uncertainty in models, scientists compare them with other models and evaluate how much the models differ in their projections. To determine this, an ensemble of models is needed, allowing a range of simulations and projections to be analyzed and compared. The World Climate Research Programme has established the Coupled Model Intercomparison Project (CMIP) specifically for this purpose. An agreed-upon suite of historical simulations and future climate projections are performed using the same external forcing (changing GHGs, land-use, etc.). The outputs from the models are archived in a common format for analysis by the climate research community (Taylor et al., 201250). Previous versions of CMIP have provided model results assessed in earlier IPCC Assessment Reports. The most recent, fifth phase of this project, CMIP5, provided climate model results that were assessed in the IPCC Fifth Assessment Report (IPCC, 201323), and many of these results are available from the Canadian Climate Data and Scenarios website. Future climate projections in CMIP5 used the Representative Concentration Pathways emission scenarios (see Section 3.2) (van Vuuren et al., 201154). A new version, CMIP6, is currently underway and will serve as input to the IPCC Sixth Assessment. Confidence in climate model projections arises from many sources. First, climate models are solidly based on physical laws and scientific understanding of physical processes. Second, climate model results are evaluated in detail by comparing model output to observations, as described in Section 3.3.1. The model evaluation chapter in the most recent IPCC Assessment report provides many examples (Flato et al., 201314). Third, some of the models used to make climate projections are also used to make seasonal climate predictions whose skill is routinely evaluated (e.g., Kirtman et al., 201328, Merryfield et al., 201336; Sigmond et al., 201347; Kharin et al., 201727). There are, however, uncertainties that have to be considered when using model projections. These uncertainties stem from the fact that models cannot simulate all physical processes exactly (and therefore must make approximations), and from internal variability in both the simulated and the real climate system (see Chapter 2, Box 2.5). The uncertainty due to approximations of physical processes can be reduced, in principle, and models continue to improve in this regard (Flato et al., 201314). However, it is impossible to reduce the uncertainty from internal variability that is superimposed on the underlying forced climate change. In addition, there is uncertainty about what future climate forcing (e.g., future GHG emissions) will be, which is accounted for by making projections with a range of forcing scenarios. These sources of uncertainty vary in importance depending on the time and space scale under consideration — generally, uncertainties diminish at larger spatial scales as internal variability “averages out” to a certain degree when one considers larger regions (e.g., Hawkins and Sutton, 200921). This also means that uncertainty is larger when one looks at small regions or specific locations. In addition, at longer time scales (say, by the end of the 21st century), uncertainty is dominated by differences in the forcing scenarios and internal variability is, by comparison, much smaller. As described in Section 3.2, climate projections are a result of driving climate models with different future forcing scenarios (RCPs, in the case of CMIP5). These projections include the response of the climate system to external forcing (e.g., changing GHG concentrations), internal variability, and uncertainties associated with differences between models. These effects can be separated, to some extent, by drawing upon projections from multiple models (e.g., Collins et al., 20135). The multi-model average provides an estimate of the response of the climate system to forcing, since internal variability and model differences are “averaged out” to a large extent (see Box 3.2). The upper panel of Figure 3.6 shows the change over time in global mean surface air temperature, as simulated by the CMIP5 models, spanning the period from 1950 to 2100. The heavy lines indicate the multi-model average, and the shaded band represents the range of model results around this average. Within this shaded band, each individual model result would look like one of the individual coloured lines in Figure 3.5, but for clarity this collection of individual lines is shown as a shaded band. The high emission scenario (RCP8.5) results are shown by the red line and the orange shaded band, whereas the low emission scenario (RCP2.6) results are shown by the blue line and the blue shaded band. Climate change projections are generally based on an ensemble of climate models representing the state-of-the-art in understanding and modelling climate. The reason for using an ensemble of models is that no single model can be considered the best, since different models exhibit varying levels of realism in simulating climate, depending on the region and variable of interest. Even if a single best model could be determined, there is no guarantee that its present-day performance would cause it to give more reliable projections of future climate. Climate change projections differ from weather forecasts in several crucial respects. One important difference is that, while we learn the accuracy of weather forecasts in the next few days, the true performance of future climate projections will remain unknown until many decades from now (Weigel et al., 201055). In the absence of a consensus on which models are the best, common practice has been to rely on “model democracy,” whereby each model in a multi-model ensemble is treated equally. This equal-weighting method assumes that each model is different and yet equally plausible. In recent years, however, there is increasing evidence in the scientific literature that model democracy has some drawbacks. Accurate present-day model performance may not guarantee future performance, but poor performance clearly does not inspire confidence (for example, models that severely underestimate current Arctic sea ice coverage may not be reliable in projecting future changes in sea ice coverage). As a result, there is a growing appreciation that some performance-based weighting of model projections may be appropriate. Indeed, the IPCC Fifth Assessment illustrated this for the case of Arctic sea ice (Collins et al., 20135). However, a clear consensus on to how to weight models has not yet emerged. A further drawback of model democracy is that it assumes each model is independent. However, climate models often share common features because one model may use computer code adopted from another model with minor adjustments, or two models may have been developed from a common earlier model. Although schemes to account for model performance and independence are being developed and tested (e.g., Sanderson et al., 201743; Knutti et al., 201729), this is still an emerging area of research. Initial exploration of weighting approaches suggests that differences between weighted and unweighted projections for Canada are small, and so traditional, unweighted multi-model projections are presented in this report. There are two key points illustrated in the upper panel of Figure 3.6. First, when looking at projected climate change, the spread across models (the vertical extent of the shaded bands) is smaller in the near term (to around 2040) than it is toward the end of the 21st century, indicating that model uncertainty has a larger effect further into the future. (Internal variability also contributes to the width of the shaded bands, as described previously, but the size of this contribution is not expected to change significantly in the future.) Second, the differences among forcing scenarios are small in the near term, but become large toward the end of the 21st century (as illustrated by the growing separation between results for the low emission scenario [RCP2.6] and high emission scenario [RCP8.5]). For simplicity, the medium emission scenarios (RCP4.5 and RCP6.0) are not shown in the main part of the figure, but their end-of-century results are shown on the right-hand side of the top panel for comparison. Adapted from IPCC (2013) Figures SPM.7 and SPM.8 and Collins et al. (2013). On average, the models project a future global mean temperature change (relative to the 1986–2005 reference period) of about 1°C for the low emission scenario (RCP2.6) and 3.7°C for the high emission scenario (RCP 8.5) by the late 21st century, with a 5%–95% range of about 1°C above and below the multi-model average. This change is over and above the 0.6°C change that had already occurred from 1850 to the reference period. Therefore, the average projected change under the low emission scenario is consistent with the global temperature target in the Paris Agreement of limiting global warming to between 1.5°C and 2.0°C, although the projected range from all models extends both below and above this target. The low emission (RCP2.6) scenario requires emissions of CO2 to peak almost immediately and reduce to near zero before the end of the century. Recent studies (e.g., Millar et al., 201737) provide more detailed analysis of scenarios that will limit warming to 1.5°C, and these also involve very rapid and deep emission reductions. More details regarding future projections, with a focus on Canada, are provided in other chapters of this report. Confidence in climate change projections varies by region and by climate variable. So, for example, confidence in temperature change is higher than confidence in precipitation change. This is in large part because temperature change is a direct consequence of radiative forcing, whereas precipitation change is affected by a number of complex interactions, including changes in the water-holding capacity of a warming atmosphere, in global atmospheric circulation, in evaporation, and in other factors (e.g., Shepherd, 201446) (see Chapter 4). Changes in snow and ice are a consequence of changes in both temperature and precipitation and are discussed in more detail in Chapter 5. Freshwater availability (see Chapter 6) and ocean changes (see Chapter 7) are also affected by changes in temperature and precipitation, as well as by other factors. Earth system models can be run in two different ways: one in which GHG concentrations are set and another in which GHG emissions are set (both are available as part of the RCP datasets). Concentration-driven simulations allow scientists to assess the difference, from one model to another, in how the climate responds to identical changes in GHG concentrations in the atmosphere. This helps separate the response of the climate system to a change in forcing (e.g., change in GHG concentrations) from the effect of carbon-cycle feedbacks involving the terrestrial and oceanic biospheres. The response of these natural carbon sinks to atmospheric CO2 levels and to climate change will influence anthropogenic emissions compatible with a given CO2 pathway. Therefore, an interesting aspect of these concentration-forced simulations is that global anthropogenic emissions can be computed — emissions that are compatible with the prescribed concentration pathway (e.g., Jones et al., 201325). The range in compatible CO2 emissions between different models provides a measure of the uncertainty inherent in representing carbon-cycle feedbacks in models. Figure 3.7 illustrates results from compatible emission calculations and shows that, while there is some variation, this group of models is consistent. For the RCP 2.6 scenario in which temperature is stabilized below about 2°C, the models have compatible emissions that start reducing immediately and reach near zero well before the end of the century. In summary, many Earth system models have been developed and used to make projections of future climate. Uncertainty in these projections arises from internal climate variability, from shortcomings in the models themselves, and from differences between plausible future forcing scenarios. Analysis of the entire collection of model results allows the first two sources of uncertainty to be reduced (though not eliminated), as model errors and internal variability are reduced by averaging across models. In the near term, to about 2040, the differences between forcing scenarios is not large. By the end of the 21st century, however, the global mean temperature increase projected for a low emission scenario is roughly 1°C, while for a high emission scenario it is roughly 4°C. The lower emission scenarios require rapid cuts in human emissions. CO2 is the largest contributor to anthropogenic radiative forcing and hence the dominant driver of anthropogenic climate change (Myhre et al., 201339) (see Chapter 2, Section 2.3.2). It also has a very long atmospheric lifetime (see Box 3.3). These properties mean that CO2 emissions are the dominant control on future climate change. Traditionally, the focus has been on annual average emissions and their changes over time. However, recent research has found that the accumulation of CO2 emissions over time are what determine global warming. From this research has emerged the concept of a level of cumulative emissions (called a cumulative carbon emissions budget) that must not be exceeded in order to limit temperature increases to a certain threshold. The IPCC Fifth Assessment Report found that warming induced by CO2 at any point in time since the beginning of the Industrial Era is proportional to the total amount of CO2 emitted up to that time (cumulative CO2 emissions; IPCC, 201323). This relationship has been seen in a range of climate models, across a range of emissions pathways, and even at high levels of cumulative emissions (Tokarska et al., 201652). Figure 3.8 shows that average warming is closely proportional to cumulative CO2 emissions for the CMIP5 models’ simulation of a CO2 increase of 1% per year (thin black line). In this idealized simulation, atmospheric CO2 concentration increases from its 1850 value of around 285 ppm by 1% per year until its concentration quadruples in 140 years to about 1140 ppm. The relationship between cumulative emissions of CO2 and global mean surface temperature (GMST) is altered somewhat by the effects of other climate forcing agents (such as CH4, N2O, and various aerosols) that are included in the RCP scenarios, as shown by the divergence of the coloured lines in Figure 3.8 from the thin black CO2-only line. 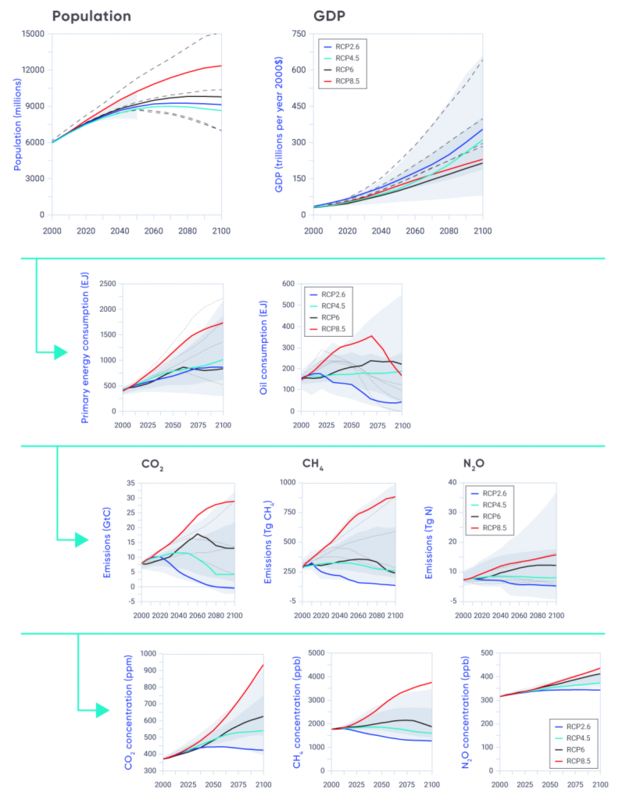 Yet the total warming (due to CO2 and other climate forcing agents) is approximately the same, as a function of cumulative emissions, across the four RCP scenarios shown in Figure 3.8. There is uncertainty in the relationship between warming and cumulative emissions, indicated by the shaded bands in the figure, and this must be taken into account when interpreting the results. This relationship between cumulative CO2 emissions and the increase in GMST can be used to estimate the maximum amount of CO2 that can be emitted while limiting the temperature increase to a certain level. So, for example, in order to limit global warming to less than 2°C, as agreed in the Paris Agreement (UNFCCC, 201553), cumulative emissions of CO2 must stay below a given level. Because of the uncertainty in this relationship, a likelihood must be attached to this level. Hence, the IPCC (2013) assessed that, to have a 50% chance of keeping global warming to less than 2°C, CO2 emissions from 2011 onward would have to remain below 1300 billion tonnes of CO2 (GtCO2), roughly equal to what has already been emitted since the beginning of the Industrial Era. For a 50% chance of keeping the temperature increase to less than 1.5°C, emissions from 2011 onward would have to be limited to 550 GtCO2. Similar carbon emissions budgets were obtained using an integrated assessment model driven by a broader range of scenarios, an approach that may be more robust (Rogelj et al., 201642). The median IPCC (2014) 1.5°C emissions budget of 550 GtCO2 relative to 2011 is only 13.8 years of CO2 emissions at current levels of approximately 40 Gt CO2 per year, and we have already used about six years of this. However, several recent studies calculated this budget using an alternative approach, based on an estimate of human-caused global warming from pre-industrial times to 2015 of approximately 0.9°C (e.g., Millar et al., 201737). This leaves room for an additional approximately 0.6°C of warming to be consistent with a 1.5°C target. From this, cumulative carbon emissions budgets consistent with limiting warming to 0.6°C relative to 2010–2019 with 50% or more chance were estimated to be 760–850 GtCO2 (Millar et al., 201737; Goodwin et al., 201819; Tokarska and Gillett, 201851), substantially more than the 390 GtCO2 (from 2015) assessed by IPCC (2014). Conversely, accounting for carbon-cycle feedbacks involving permafrost, which were not included in the models assessed by IPCC (2014), would somewhat increase the warming for a given level of CO2 emissions and hence somewhat reduce the emissions budgets, particularly at higher warming levels (MacDougall et al., 201531). The upcoming IPCC Special Report on Global Warming of 1.5°C will comprehensively assess these emissions budgets and give an updated estimate of the remaining allowable emissions to meet the global temperature target under the Paris Agreement. Adapted from IPCC (2013), Figure SPM.10. Earth system model simulations of the response to CO2 emissions show that GMST remains approximately constant for many centuries following a cessation of emissions (Collins et al., 20135). For example, GMST remains high in two simulations of Environment and Climate Change Canada’s first-generation Earth system model, CanESM1, under a scenario in which CO2 emissions increase and subsequently cease, being reduced to zero in 2010 or in 2100 (Figure 3.9; Gillett et al., 201118). Similar results are obtained using other models (e.g., Matsuno et al., 201234; Matthews and Caldeira, 200835; Frölicher and Joos, 201016). Thus, regardless of when emissions cease, GMST remains approximately constant for the subsequent millennium. Ceasing emissions of aerosols, which are short-lived and that largely exert climate-cooling effects (see Box 3.3) would lead to rapid warming, whereas ceasing short-lived GHG emissions would cause cooling (Collins et al., 20135). The response to a cessation of emissions of other long-lived GHGs is qualitatively similar to that to CO2 (Smith et al., 201248), taking a very long time to reduce temperature. While GMST is expected to remain constant after emissions cease, other aspects of the climate system are expected to continue to change. Vegetation, ice sheet volume, deep ocean temperature, ocean acidity, and sea level are projected to change for centuries after stabilization of GMST (Collins et al., 20135). Climate forcers, also referred to as climate forcing agents, act directly to change climate and include both natural and human contributors. They are often distinguished as short- or long-lived, according to their lifetime in the atmosphere. For example, carbon dioxide (CO2), the largest climate forcer from human activity, is considered long-lived. Although often described as having a lifetime of a century or more, a single lifetime value is not strictly applicable (owing to its complex interactions with the Earth system), but an estimated 15%–40% of CO2 emitted by the year 2100 will remain in the atmosphere, and continue to exert a climate warming effect, for more than 1000 years (Ciais et al., 20134). Short-lived climate forcers are those with a lifetime of a few days to a few decades and include sulphate aerosols and black carbon (soot) with lifetimes of a few days; tropospheric ozone and various hydrofluorocarbons, with a lifetime of a few weeks; and methane, with a lifetime of a decade or so. Reducing emissions of short-lived substances leads to lower atmospheric concentrations of these substances shortly thereafter. Many of these short-lived species contribute to poor air quality. Those that have a climate warming effect are also referred to as short-lived climate pollutants (http://www.ccacoalition.org/en/science-resources) and include black carbon, methane, and tropospheric ozone. In some cases, aerosols that have a cooling effect are co-emitted with short-lived warming agents (Arctic Council, 20111), complicating estimates of the near-term effectiveness of emission reductions. Short-lived climate forcers are important in climate policy discussions because targeted mitigation of those with warming effects can both slow global temperature increase and improve human health by improving air quality. In summary, many aspects of climate change are irreversible on multi-century timescales. CO2 persisting for a century or more in the atmosphere is the main determinant of global mean temperature change, and global temperature will remain elevated even after emissions cease. GMST could be reduced only if human intervention could remove CO2 from the atmosphere over a sustained period. Climate projections must be made using global models because many of the processes and feedbacks that shape the response of the climate system to external forcing operate at the global scale. For many applications, where only the change in some climate quantity is needed, global model projections can be used directly. This is because climate change normally applies over a much larger area than the climate itself, which can vary markedly over short distances in some regions. This is particularly the case for projected change in temperature, which has a very broad spatial structure, although local temperature may differ between, for example, the bottom of a valley and the surrounding hillsides. However, for other applications, global climate model projections are not adequate, as they typically have horizontal spatial resolution, or grid spacing, of 100 km or coarser (see Figure 3.2 for explanation of model characteristics) (e.g., Charon, 20143). As an example, when using climate projections to drive a detailed hydrological model at the scale of a drainage basin, one needs values of future climate variables at a scale that respects local topographic, coastal, and other features, and represents high-frequency variability and extremes. Users of climate projections must therefore first evaluate whether they really need high-resolution climate scenarios or whether they could make effective use of lower-resolution climate change scenarios. Higher resolution, in and of itself, does not necessarily indicate higher-quality or more valuable climate information. But, for many applications, higher resolution may be necessary, and can also facilitate better understanding among, and communication to, users. A caution, however, is that internal climate variability is reduced by averaging results over large areas, and so as one goes from global to regional to local scale, internal variability becomes larger, leading to larger uncertainty in projections at the local scale, relative to that at regional or global scale (Hawkins and Sutton, 2009 21). When climate information at a higher spatial- or temporal-resolution is needed, there are several approaches available to take global climate model projections and “downscale” them to higher resolution for a region of interest (or even a single location). These generally fall into two categories: statistical and dynamical downscaling. Statistical downscaling is a form of climate model “post-processing” that combines climate model projections with local or regional observations to provide climate information with more spatial detail (Maraun et al., 201033; Hewitson et al., 201422). Statistical post-processing methods typically downscale to higher resolution and correct systematic model biases. A simple example is the so-called “delta method,” in which the change in some climate quantity, obtained from a climate model projection, is added to the observed historical value of that quantity. This allows projected changes from different climate models to be used in a consistent manner, since each model’s climatological bias is eliminated. Bias correction is particularly important when using downscaled climate information to drive impact models that depend on crossing absolute thresholds. For example, snow accumulation is sensitive to whether temperature is above or below freezing. Simple techniques like the delta method may be suitable for some quantities, such as mean temperature, but not for others, such as daily precipitation, for which biases may be manifested differently, in variability, extremes, or dry/wet spells (Maraun et al., 201033). More complex statistical downscaling approaches are required in such cases, making use of detailed high-resolution observational datasets that reflect local topographic influences. These high-resolution data are used to interpolate low-resolution climate change projections to much higher resolution. In some cases, bias correction and other refinements are applied to correct statistical properties such as variances (Werner and Cannon, 201656). 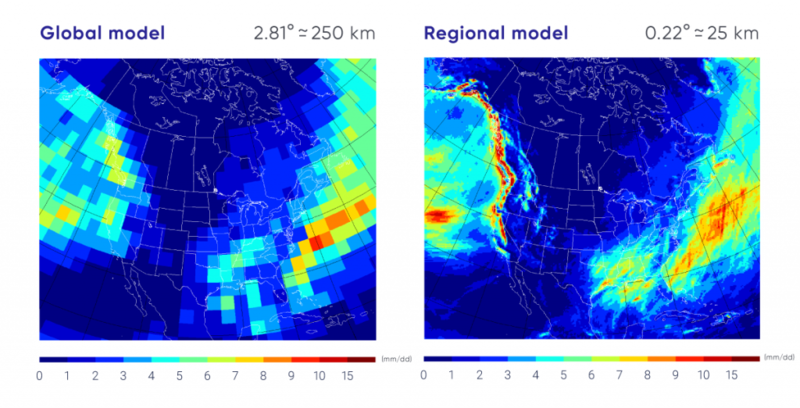 Yet other statistical downscaling methods take advantage of observed relationships between large-scale atmospheric circulation patterns, which are often well simulated by climate models, and local variables. By assuming that these statistical relationships remain fixed under a changing climate, climate model projections of circulation patterns can be used to make projections of future climate at a particular location. The statistical relationships introduce some aspects of local climate that may not be well represented in the driving global model (e.g., local topography and proximity to a lake). Fundamentally, all statistical downscaling methods assume that relationships between a model’s historical simulation and observations do not change over time, and that the information provided by the climate model and historical observations at their respective spatial scales is credible. Thus, the quality of statistical downscaling is directly related to the quality and availability of observational data. Recent critical reviews provide more information on the strengths and weaknesses of statistical downscaling and bias correction methods (Hewitson et al., 201422; Maraun, 201632). Dynamical downscaling involves the use of a regional climate model, which is a physically based climate model (of the same level of complexity as a global model) that operates at high resolution over a limited area. Regional climate models incorporate much the same physical processes and scientific understanding as global climate models and indeed often share much of the same computer code. The important distinction is that regional climate models are driven at their lateral boundaries by output from a global climate model, as shown in Figure 3.10. The regional model also inherits errors and biases that may be present in the global model whose results are provided at the boundaries. The main advantage of dynamical downscaling is that, due to its limited area, a regional model can simulate climate on a much higher resolution than is possible with a global model, using a similar amount of computing effort. This additional detail is often desirable, particularly where the regional model output is used to drive another model (e.g., a hydrological model in which detailed basin geometry, high-frequency precipitation and extremes, and other small-scale features are essential). However, it remains an ongoing research topic to determine whether, and under what conditions, regional models add value relative to the original global model results that are being downscaled. There are no agreed-upon measures for added value (Di Luca et al., 201510; 20168; Scinocca et al., 201645), although the evidence available at the time of the IPCC Fifth Assessment indicated that there is added value in some locations owing to the better representation of topography, land/water boundaries, and certain physical processes, and that extremes are better simulated in high-resolution regional models (e.g., Flato et al., 201314). Based on simulations described by Scinocca et al. (2016). An additional advantage of dynamical over statistical downscaling is that physical relationships between different climate variables (such as temperature and precipitation) are maintained. For very-high-resolution dynamical downscaling (at model resolution of a few kilometres), physical processes such as convection can be resolved explicitly and can lead to improved simulation of climate variables such as precipitation extremes. Several recent studies indicate added value, including a dynamical downscaling system that includes a detailed representation of the Great Lakes (Gula and Peltier, 201220), the potential for added value near well-resolved coastlines (Di Luca et al., 20139), and evidence for improved simulation of temperature and precipitation extremes (Curry et al., 2016a6,b7; Erler and Peltier, 201611). Both statistical and dynamical downscaling approaches have been applied and evaluated in many areas of the world. For North America, coordinated dynamical downscaling comparisons have been undertaken as part of the North American Regional Climate Change Assessment Program (NARCCAP: http://www.narccap.ucar.edu/) and the Coordinated Regional Downscaling Experiment (CORDEX: https://na-cordex.org/). For CORDEX, simulations were run at resolutions of approximately 25 km and 50 km. In both NARCCAP and CORDEX, Canadian models are represented. Coordinated experiments like these provide results from different regional climate models, driven at their boundaries by output from different global climate models. They also allow scientists to determine whether regional differences in projected climate change are related to the differences in the global driving models or to differences in the regional downscaling models. However, the CORDEX ensemble is considerably smaller than the CMIP global model ensemble, and studies using the CORDEX ensemble tends to focus on sub-regions rather than on Canada as a whole. For Canada, regional climate models with smaller domains and higher resolution are being used, particularly by the Ouranos consortium and the Centre pour l’étude et la simulation du climat à l’échelle régionale (ESCER) at the Université du Québec à Montréal. Some of these simulations provide results at 15 km resolution (e.g., https://www.ouranos.ca/en/program/climate-simulation-and-analysis/). Statistical downscaling results are also readily available for Canada (https://www.pacificclimate.org/data/statistically-downscaled-climate-scenarios), with daily temperature and precipitation data at approximately 10 km resolution. These state-of-the-art downscaling approaches (Werner and Cannon, 201656) are driven by multiple global climate model projections. In addition to the more detailed spatial structure, sophisticated statistical downscaling approaches can also provide estimates of future changes in climate extremes and other indices (such as frequency of hot days, growing season length, and drought indices) that are particularly important for certain impact studies (see Chapter 4). Downscaled results can also be used as inputs to impacts models — such as hydrological, crop, and ecosystem models — that are sensitive to variability on small spatial scales and to biases in climate models (Wood et al., 200457). In summary, global Earth system models are necessarily limited in the level of fine spatial detail they can resolve. Techniques such as statistical or dynamical downscaling allow transformation of these large-scale projections to a level of detail better suited to the climate information needs of many local and regional impact studies. It must be noted, however, that uncertainty due to internal climate variability is reduced by area averaging (e.g., averaging over Canada or the globe), and so uncertainty in climate projections is larger as one goes from global to regional to local scale.